The companies of the Goldschmidt Thermit Group and their partners offer you a unique range of products and services for the construction, renovation, modernization and intelligent predictive maintenance of railway tracks. Whether high-speed, heavy haul, cargo, trams or subways, with our unique range of products and services, continuous research and development, we guarantee our customers that we will understand and fulfil their needs and expectations. Our product and service portfolio includes rail joining, rail services, measurement, tools and machines and equipment. Thanks to the efficient networking of our over 20 medium-sized group companies and partners worldwide we serve the international growth market of the rail-mounted traffic infrastructure – and this very successful on all continents. With local presence, technological innovations, high quality consciousness and years of experience we are always at your side. We know exactly what is required for the successful long-term operation of high quality tracks. In this way, we took pioneering steps into the digital work site and combined a collection of modern, high performance stand-alone solutions into a digital network consisting of intelligent products. Our database solution DARI® – Data Acquisition for Rail Infrastructure – enables us to make our products smarter, more effective and sustainable. In the future, more and more processes and tools will be connected so that they can communicate intelligently with each other to achieve the highest degree of precision, quality, efficiency and comfort in new construction and maintenance. Take advantage of this expanded, unique service portfolio for greater safety, reliability and availability for your tracks and discover new potential for added value together with us by digitalizing work processes in all facets of the railway infrastructure. With our Thermit® welding processes nearly all rails of various profiles and grades worldwide can be continuously welded. 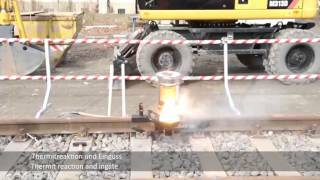 Thermit® rail joining safely and quickly connects rails with different Thermit® welding processes, which are suitable to specific customers. Implementation is characterized by very low demands in material, time and manpower, and offers the highest standards of quality and reliability. The significant mobility and applicability of this method means that welding can proceed under traffic. We develop, manufacture and supply all components required for our Thermit® welding processes. Our experienced welding specialists carry out arc welding with the submerged arc welding technique and the manual metal electric arc method. Insulated rail joints are required to determine the position of the train for the purpose of safe signal control. We produce and market various types of insulated joints with different properties according to the type of force application, installation and manufacture. Their common advantages are: they offer the highest safety, reliability and durability – in all climates. All our insulated joints are manufactured from steel or polymer composites. Professional maintenance is an important preventive measure against wear due to heavy rail traffic and serves to sustainably lengthen the service life of rails and switches in subway systems, tramways, light rail and mainline networks. Intelligent predictive maintenance of railway tracks allows you to work more efficiently and your network runs according to schedule– safely, reliably and with a long life. Thanks to our highly mobile equipment, our teams are particularly flexible; they are able to manage the required welding and grinding work also on existing rails where access can be difficult – quickly and efficiently. We can offer hardening and weld-tempering of new rails according to customer specific requirements. The gauge corner, gauge face and running surface of rails are weld-tempered by milling the rail and applying new wear-resistant weld material to rebuild the section. This method secures a significant reduction in vertical and lateral rail wear and ensures safety of traction operations in the long term. Thanks to the extended lifespan of both the rail and the entire superstructure noise emissions are minimized, while maintenance costs are reduced. 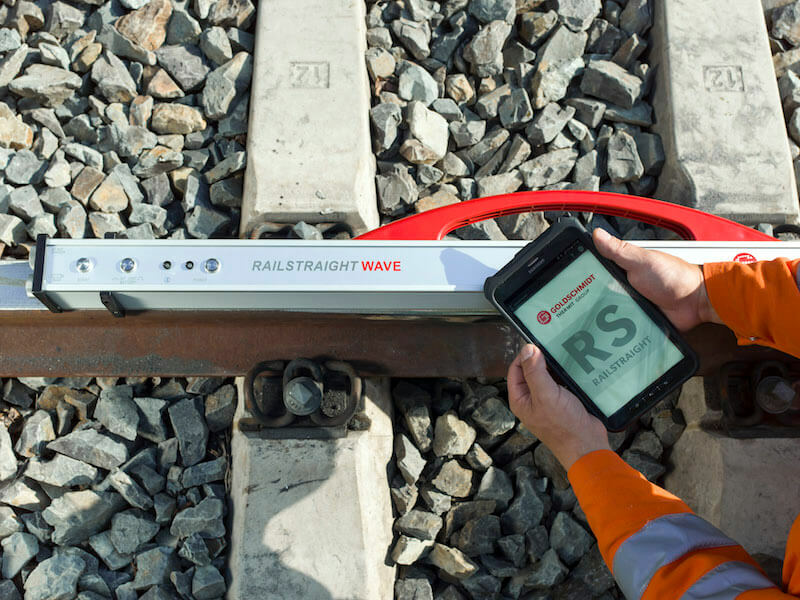 Modern track measurement devices and state of the art technology is used to fulfil various measurement tasks and special work assignments, complemented by a broad and application-specific range of measuring devices. We develop most of the rail measurement technology ourselves. At all times we guarantee you maximum safety, high quality and availability of your tracks, preventive maintenance and improved comfort for passengers. We offer a wide product range of efficient tools and machines for track works including various applications like Thermit® welding, track construction and maintenance as well as numerous hydraulic power units to drive the equipment and also for use with applications in many other industries and measuring devices. Our tools assure the safety and the comfort of the workers using the tools, are reliable thanks to the use of high quality components and reliable equipment. Our SRS road-rail vehicles can be used both on rail and on the road and are custom made to meet your needs and requirements thanks to different attachments and superstructures. We offer a high quality range of rail track tools and equipment to ensure your rails are always in operation. Our self-regulating switch heating SMARTSWITCH HEAT keeps the rail warm to prevent problems. The special self-regulating heating cable ensures a distribution of the heating output which is suitable for the requirements of the rails and switch components. This prevents overheating and reduces energy consumption at higher temperatures. An additional temperature and snow sensor measures the ambient conditions. Based on the set values a controller automatically turns the switch heating on and off. The combination of these two measures ensures an efficient and secure operation. TRACKSAFE LUBE is an intelligent lubrication device to reduce rail wear and noise with an intelligent control unit that allows lubrication to take place only when needed making the dosing very economic. TRACKSAFE LUBE is suitable for all rail profiles. It is equipped with a solar module enabling independent, energy-saving power supply. TRACKSAFE LUBE can be used in urban and non-urban areas and is quick and easy to install. The magnetic barriers TRACKSAFE BARRIER guarantee absolute safety when working on all types of railway tracks. The fixed barrier ensures an effective guard on the side when working in the danger area of the tracks. The special feature of the system is the use of a strong magnet to enable quick and easy installation without the need to remove ballast. The imperial patent no. 96317 marked the begin of a real success story: in 1895 Prof. Hans Goldschmidt of the company Chemische Fabrik Th. Goldschmidt AG, founded in 1847, developed the alumino-thermic process – the Thermit® process for continuous welding of railway tracks. In the following years, various partner companies were founded around the world, giving rise to a group that today boasts almost 1,000 employees in 20 countries. The spirit of the inventor of the Thermit® welding process, Prof. Goldschmidt, remains with us today: through the drive to do things better, improve existing processes, and develop new ideas. We can offer you a unique range of products and services for more efficiency, more safety and more travel comfort on your railway tracks. Whether construction, renovation, modernization and intelligent predictive maintenance of railway tracks – with us you’re moving on safe tracks. Certificates and approvals of our companies include quality management certification according to ISO 9001:2015 and AAR M-1003, environmental management system according to ISO 14011:2015, approval by all major railway companies in more than 80 countries and approval as a Q1 supplier for Deutsche Bahn AG.